‘The Power and The Water’ Project’s focus (read Marianna Dudley’s recent blog on this) at the Bristol Festival of Nature, 12-14 June, currently the largest free event of its kind in the UK, highlights the power of place as a platform for historical and political environmental debate. At our stand, the general Festival theme of all things ‘nature’ had a Bristol slant: hidden histories of Bristol’s rivers. Festival-goers interested in Bristol (mainly local, but also from up and down the country) came to talk to us about Bristol issues, and to compare these with issues elsewhere. Aspects of local history depicted on our posters brought visitors over to share folk memories and childhood reminiscences with us: the River Avon as a busy shipping route; the whale that washed up on the banks of the River Severn in 1885; the traditional traps or ‘putchers’ used in the Severnside salmon-fishing industry. These opened the way for more contemporary topics: water quality and riverine/marine litter, especially non-biodegradable plastics waste, and possible solutions to this problem, about which there is considerable community feeling. Many people, it seems, regularly undertake their own private litter-picks along the river banks and other green spaces where they like to walk – and also feel strongly that the issue is as much one of plastics ubiquity as it is about responsible waste disposal. Of course, many aspects of local waste management and water quality have improved significantly since the days when, as our posters showed, the River Frome became so polluted on its way through Bristol that the nineteenth-century solution was to culvert it. However, we can also look back to the era when Bristol water was an industry in itself, rather than a conduit for industrial and domestic waste. In the eighteenth century, bottled water from Hotwells on the banks of the Avon, then just downstream of the city and a famous spa destination, was exported as an elixir of health – with the consequent rise in demand for glass bottles providing impetus for the Bristol glass industry. Those eighteenth-century glass bottles can be seen as part of a cycle of bottled-water consumption extending forward to today’s plastic riverbank detritus, and, hopefully, towards future strategies for dealing with this and other products of the petrochemical age. 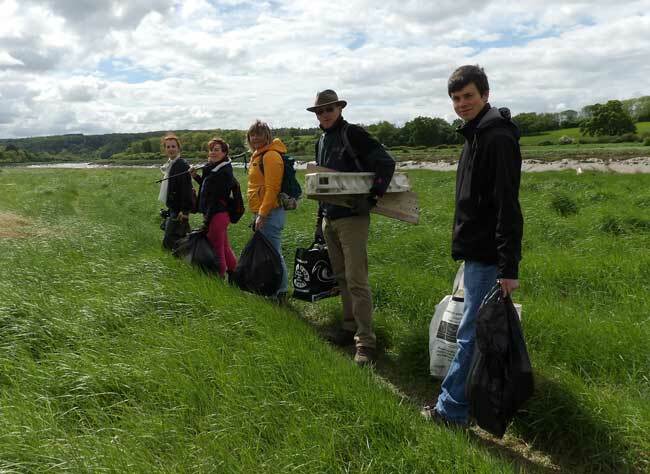 ‘The Power & The Water’ Project team members and associates on the River Avon tidal floodplain at Sea Mills with plastics waste for the Festival of Nature stand, May 2015. Photo: J Payne. The power of place in stimulating environmental debate also underpins the European Commission’s Green Capital initiative, which supports and encourages European urban authorities in their environmental commitments and achievements. Next week, Bristol will be halfway through its year as European Green Capital. Before it hands over the title to Slovenia’s Ljubljana in 2016, Bristol’s environmental provisioning will be given a global showcasing at the UN’s 2015 Paris Climate Conference in December. Bristol’s presentation at the Paris Conference must necessarily focus on the future; viable strategizing for the environmental scenarios that may lie ahead will, however, be enhanced by further understanding of past as well as current and future issues, and the relationships that bind them. See for example ‘The Bills of Lading of Noblet Ruddock & Co, 1720’ in WE Minchinton, ed, The Trade of Bristol in the Eighteenth Century (Bristol Record Society, 1957), pp. 78; 80. William Matthews, The New History, Survey and Description of the City and Suburbs of Bristol (W Matthews, 1794), p. 40.